The palm-sized Creative Muvo 2C features a water-resistant design that allows you take epical tunes through the adventures of your life. With the 6 hours battery life and a size that will fit on your palm, you will play your favourite music loud when out wandering for adventures. The connection process is easy through the various input sources like Bluetooth connectivity. You can link two Muvo 2C speakers to enjoy a wider stereo experience and better sound performance. The manufacturer offers this product in four different colours and completes it with rubberized finish. The speaker is easier to grip on your hand. The Creative Muvo 2C is among the small but durable and highly versatile speakers in the market today. The great sounding device functions as an MP3 player and supports the high-quality audio formats. The 6 hours battery life might sound low, but it makes up for the amazing set of features – superb volume and audio quality. Creative Muvo 2C is already certified as IP66, which means that it is dustproof and water-resistant. It will handle any heavy rainfall and is available in four different colours. Here are of the things to expect when buying this product. The little speaker has a full-range driver in addition to an oversized passive bass radiator. The simple setup offers outrageously excellent audio quality level with a strong bass. The bass might not be as heavy as that of the larger portable speakers available in the market such as JBL Flip 4, but considering the size of the device, you will understand why. If compared to some other devices of similar size, Muvo 2C device has better audio quality. The device is very loud and rarely distorts at the maximum volume. If need arises, pair the device with another one and set them in stereo mode for the best experience. JBL GO is the closest competitor. The 2C is a solid device but has definite edge in durability, quality and versatility. The audio quality is similar to that of Roll 2. However, neither of the two – Roll 2 and GO – features a built-in MP3 player, which can support high-quality formats. Due to the audio quality and range, the device speaker does a great job playing a wide range of genres. It does not struggle with the more dynamic audios, a feature that is uncommon with the portable speakers that fall within the price range. That means that Creative Labs has done a great job. The weight of this device is slightly above that of the Creative Mini. However, Creative Muvo 2C specs is more compact, thicker and provides only one active driver – not two. The manufacturer rates the two speakers as IP66, but Muvo 2C is available in more colours and more features. The IP66 rating assures that the ports protective flat is already secured – the device is water-resistant and dust proof enough to handle splashes and heavy rain. You should be careful when using the device because it is not submersible. If you need a submersible portable audio device, the market offers them in large number. The clean button layout – the Bluetooth, Power, volume and play/pause controls are available. On its side, you will get the 3.5mm Aux input port, micro-USB port, and a MicroSD card slot. To enjoy the stereo-mode, you can pair the device with another one. You can also connect it to a personal computer through the USB port and charge it while still boosting the quality of your audio. The Sound Blaster Control panel will help you customize the sound more if necessary. Some people use the device as a MicroSD card reader because it is compatible with the Class 4 and higher versions. It handles 128GB of data efficiently. Even though the device is small, it might be a tighter fit in most pockets. People without deep pockets might need a backpack or a handbag for it to go unnoticed in public. Its 6-hour battery life is seemingly low, but the device makes up for that due to the user-friendliness and versatility. It does not come with 1, but its ability to play music from a MicroSD card allows the user to play the high-quality audio formats. You can expand the audio range by connecting the device to your computer through the USB port. The Sound Blaster Control Panel will come in handy with the connectivity to personal computer. 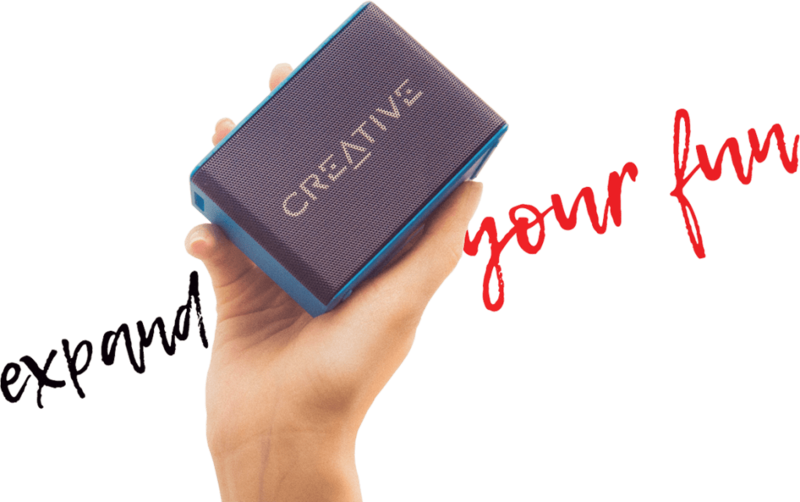 When compared to other devices of similar size, Creative Muvo 2C offers more features but is less portable. The speaker features five buttons, which the manufacturer includes for intuitive use. Use tow of the buttons to adjust the volume. The others are for toggling between AUX, Bluetooth, Power, USB, MicroSD and the last one to activate the Bluetooth feature. Even though the product has a few buttons, changing of songs is easier – to accomplish that, you just need to press the volume button down or up. After you have turned on the device, it will provide a sound – not a light flash – to tell you that it is working. That happens too after the speaker has paired with another one. The product only weighs 6 ounces and measuring 3.7 inches on the longest side, the device is a physical lightweight that you carry to any place. It is not a sleek device in the market visually, but with the boxy shape, it is small enough to fit on your palm. The vibrant colours add more visual appeal and the matte texture allows grasping without easier slipping. You can listen to music when in the shower due to the water-resistant feature. The Muvo 2C device might not replace the standard audio setups, but the sound is loud and crisp. You will feel the dimensions of an audio with pronounced bass. The device punches above the weight. The device offers 10 meters Bluetooth range, which is ideal for apartment buildings, houses and hotel rooms. The little feature allows you to connect the Muvo 2C device to other speakers to derive powerful sounds. The microSD port is the other connectivity option. Creative Muvo 2C price is much affordable among the solid speakers within the market with solid quality. The device comes with several features that you can only find on the high-end speakers like ability to connect a microSD and two speakers, but it has a weaker battery that might give you a headache. Comparing it to other speakers of the similar class, it is a great choice.